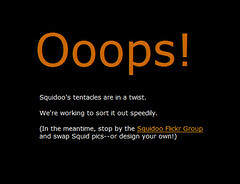 Well… that is what they (Squidoo) said, not me. I just love catching big websites with their pants down. In fact I decided to create a special category (Site Malfunctions) just for the occasion. Of course as with all of the big guys the site was not down but for a second or two. You have to be quick to actually catch them. So here’s the screenshot. Click to view the larger version on Flickr.